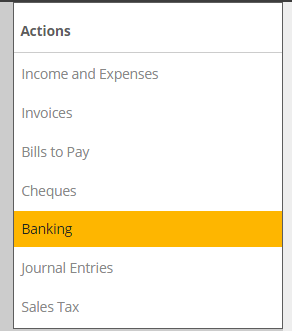 Learn how to import bank statement transactions using an OFX (Microsoft Money), QBO (Quickbooks) or QFX (Quicken) file. On your online banking website, select Microsoft Money (OFX), Quickbooks (QBO) or Quicken (QFX) as the file format to download. Save this file in a location on your computer where you can easily find it and use a name that identifies the file clearly. You do not need to open this file at this time. If you are given a choice for the date range of transactions, we recommend that you download one month of transactions at a time. 1. Go to the Banking page. 2. Select the Account field and choose the bank or credit card account you wish to reconcile. Also choose the Statement Date. The statement date is the date that you want to reconcile your books up until. 4. Click on Choose File, select the file that you downloaded from your online banking, and then click on Upload. 5. Once the file has been uploaded you will see them appear below.